New body camera video obtained by The Buffalo News shows Deputy Adam Day talking with an undercover deputy (not pictured) about how Achtyl might swing his arms when moving in to make an arrest. You know it’s bad when your colleagues speak about your misbehavior, as in “Kenny always pushes people.” It’s even worse when you and your colleagues are officers of the law. The above-mentioned comment, it appears, is yet another day in the uneven law enforcement career of Erie County Sheriff’s Deputy Kenneth P. Achtyl, who this page has already said should be fired. We’ll say it, again. Fire Achtyl. He is bad news for good deputies and worse news for an unsuspecting public. Anyone who retains any doubts about Achtyl’s suitability for law enforcement should read Sunday’s News article by reporter Matthew Spina. The article describes a deputy whose reputation elicited knowing side comments from colleagues. 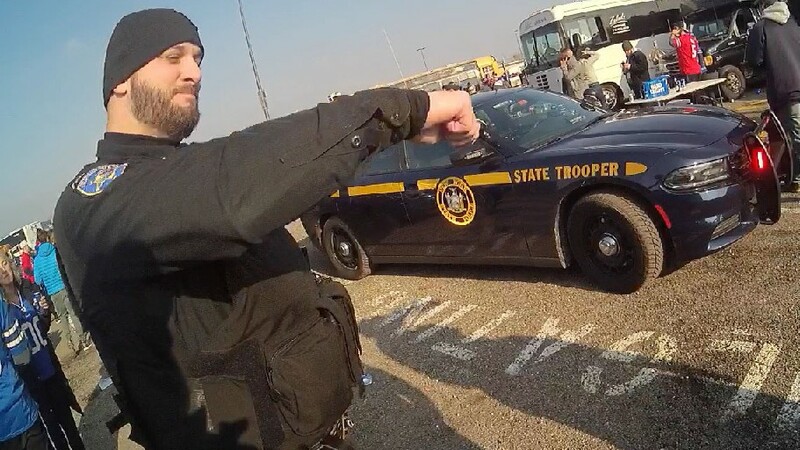 Most people are already familiar with the bodycam video showing that, outside New Era Field during a Bills game in December 2017, Nicholas H. Belsito, a 25-year-old University at Buffalo student, found himself at the wrong end of Achtyl’s temper and baton. That story in The News led to the revelation of a February 2014 incident involving the deputy in which Julie Marinaro of Amherst found herself arrested and humiliated in front of her children while attempting to drive out of Chestnut Ridge Park in Orchard Park. Marinaro was not behind the wheel. Her nanny was driving. Perhaps it was the short comment, “Just give us the ticket,” that triggered Achtyl’s ire. Meanwhile, a second body camera video has emerged revealing what one of Achtyl’s co-workers thought about his behavior. It involves the Belsito incident that began when a Bills fan tossed a beer can into a group of people, hitting Achtyl’s elbow. When the fan is spotted by an undercover deputy and Achtyl and other law enforcement move in to arrest him, it elicits an “Uh-oh,” from Deputy Bradford Ballantyne, who is standing some distance away. Ballantyne was also wearing a body camera which recorded the conversation between him and a few other deputies. “Way over on the other side of things, Kenny was just pushing somebody,” Ballantyne says. “Way down there,” Ballantyne says. “Kenny always pushes people,” Deputy Adam Day says and walks off. “And then Kenny turned into Kenny – and everybody went ‘whoosh,’ ” said the undercover cop, gesturing with his hands. Day seemed to understands what the undercover cop meant by Achtyl’s behavior and says, “He starts pushing everybody,” swinging his arms. “No, the (expletive) night stick comes out,” the undercover deputy said. Maybe not. What is Sheriff Timothy B. Howard planning to do, other than to announce to the Erie County Legislature that equipping deputies with body cameras is not a priority. What is his priority, then – protecting deputies who attack civilians? What is really troubling is that Achtyl still has a badge and a baton.